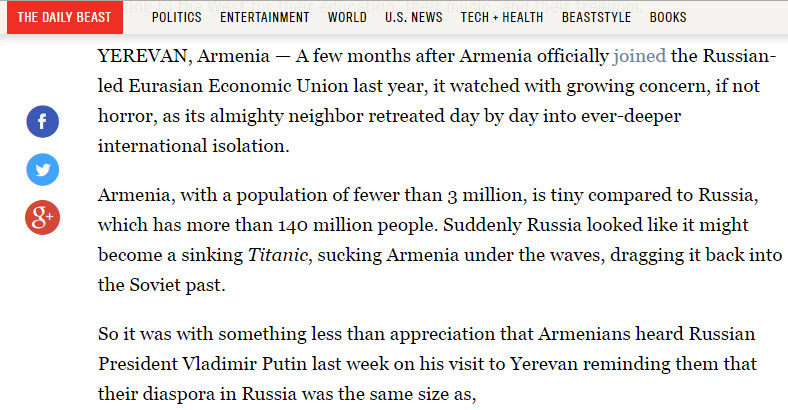 Armenia, with a population of fewer than 3 million, is tiny compared to Russia, which has more than 140 million people. Suddenly Russia looked like it might become a sinking Titanic, sucking Armenia under the waves, dragging it back into the Soviet past. An American band whose members are of Armenian descent rocked Yerevan with the kickoff of their “Wake Up the Souls” tour. Yes, indeed, the Armenians’ country is shrinking, but that does not make them less proud of their own ancient history and culture, of their independent media, developing civil society and good relations with Europe, the Middle East and the Americas—homelands for many more millions in the Armenian Diaspora. Yes, the Armenian economy is poor and memories are sad, but the hearts of the people are free and passionate. Unlike Russia, where the Kremlin labeled independent groups financed from abroad as “foreign agents,” Armenia welcomed such bridges to the West. The American University of Armenia, AUA, is at the top of Armenia’s most popular universities for its approach to higher education focused on freedom of speech, critical thinking and independent research. The president of AUA, Dr. Armen Der Kiureghian, smiles as he talked about an early-morning breakfast he had here way back in 1989. Armenian scientists had invited him, a scholar from the University of California at Berkeley, to discuss how the Armenian diaspora in the United States might help higher education in their mother country. Three years later, thanks to California’s governor at the time, George Deukmejian (of Armenian descent), the University of California, other U.S. politicians, and academics interested in establishing American universities abroad, Der Kiureghian and his colleagues founded AUA. It became the first university in a former Soviet country accredited by the USA. Today, a quarter-century later, AUA gives internationally recognized degrees. The University of California sets its rigorous standards, and among its 1,200 students are Armenia’s future elite. Der Kiureghian proudly tells The Daily Beast that four of the people representing Armenia at the United Nations are AUA graduates. Several more work for Armenian ministries. The alumni network also includes heads of major businesses, nonprofit organizations, banks, and top administrators at state institutions. “We want this university to be original and international,” said Der Kiureghian. “It is good for students from Armenia to study in an internationally friendly environment.” Last weekend the modern university campus looking out on the spectacular snow-covered Mount Ararat was full of students preparing for summer exams. While most were from Armenia, others were from India, China, Cameroon, Russia, and Ukraine. Thirty-five came from Syria with a wave of Syrian Armenian refugees escaping the war. If there was one great symbol of the irrepressible optimism of young Armenians, both in the West and here, it came the night before the ceremonies and speeches commemorating the 100th anniversary of the beginning of the Armenian genocide. And it was the kind of thing you just don’t see in a post-Soviet country. An American band whose members are of Armenian descent, System of a Down, or SOAD, rocked Yerevan with the kickoff of their “Wake Up the Souls” tour. The musicians from Southern California sang mostly in English, and there were some songs in Armenian that really did wake up many souls. “I thought I was going to cry when the band’s leader called Turks struggling for official recognition of the Armenian genocide heroes,” a young Turkish woman who traveled to Yerevan for the anniversary told the Daily Beast. Heavy rain poured down on the band’s fans, some holding flags of Armenia, Georgia, Iran, Syria, France, and the USA. But the bad weather did not scare thousands of listeners away from Republic Square, the heart of Yerevan. Official reports said that over 50,000 people were rocking on the soaking wet square. On the following day international envoys and political leaders, including Putin and French President François Hollande, joined the ceremony held at the Tsitsernakaberd Memorial Complex in Yerevan. The Russian president, who Armenians believe influences their country’s domestic and foreign policy, expressed his sincere sympathy for the victims of one of “the most awful tragedies in the history of mankind.” Speaking at the ceremony, Putin pointed out that Russia played a significant role in Armenia’s modern history: “The international condemnation of violence against the Armenian people was the result of the Russian diplomatic effort,” Putin said.